2 or more: $21.55 ea. 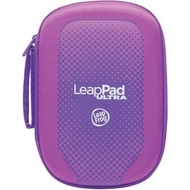 The LeapPad Ultra Carrying Case Purple is a kid-tough, zippered case that snugly holds your child's LeapPad Ultra and 6 games. It's designed to travel with you easily and features a tote-safe wrist-strap. Recommended for children age 4-9 years. Designed to store and protect your LeapPad Ultra wherever you go, the LeapPad Ultra Carrying Case features a molded design that hugs your device snugly, plus built-in bumpers protect the screen. The LeapPad Ultra Carrying Case holds 6 game cartridges and an extra stylus. Works exclusively with LeapPad Ultra Learning Tablets.